I’ll take the Eel, please. Yes, you heard me right. Eel! I like it. I like it A LOT! 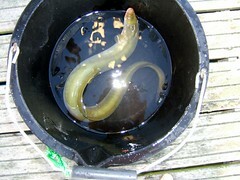 After posting my ABC Leap Foods last week, I thought I’d do a post about eel…because I got so many comments about it. Now, to clarify…I don’t like eel right out of the ocean. I live in Idaho, and can’t go down to the beach, throw a line and wait for an eel to bite and then reel him in, look him in the eye and bite his head off. I’m not that uncouth. I like my eel served up in disguise…in a barbecue suit. I was raised on very bland foods…mostly meat, potatoes, and Chef-Boy-R-Dee pizzas. My dad’s so set in his eating ways that when we went to a Mexican restaurant, he ordered a hamburger. Sigh. Because of this, I never ventured too far with spicy, exotic, weird foods in my youth. I was saved from bland eating by my husband. When we dated in high school, he took me to all sorts of crazy places: Japanese, Italian, French, Seafood, and Vegas buffets. I tried octopus, shark, lobster, fancy pasta dishes, bisque, and many other savory items. My husband’s a better explorer of new cuisine than me. I’m still satisfied with any meal that comes with mashed potatoes. But I do enjoy trying new things now (even if it’s just a bite of what my husband’s eating). The sushi place down the street–Sakana’s–is my favorite eating establishment right now. Each time I go there, I come away babbling happily about how beautiful and yummy my meal was. The Japanese waitresses don’t bat their eyes at me when I ask for a fork. They know I’m a lame white girl who can’t use chopsticks, so they humor me (and I love them for their kindness). At Sakana’s, they serve barbecue eel. I don’t know their cooking secrets, but I’ll attest to the extreme deliciousness factor of eel. It was my favorite item when we ordered a sushi boat once. I wanted a dozen more of those babies! Yum! Eel is very tender and doesn’t have a nasty fishy taste like some seafood. In the picture, it looks the most like the darker sushi by the greens. If you ever have the chance at a sushi restaurant to try some eel, go for it. It might not be as wonderful as the eel served up at Sakana’s (and that’s the only place I’ve tried it), but it might be. Guest: I was sick all week with Strep. You: Oh, yeah. Well, that’s nothing. I’ve eaten EEL! Thanks for making me laugh – it doesn’t look so appetizing in that first picture though! I agree you’re very brave. Yes, brave. I can eat calamari, but eel is one of those things I’ve never been able to try. I have tried a fried grasshopper…. No, I wouldn’t recommend it! Grasshopper! Now that would be something to stop someone dead in their tracks at a party. But seriously, I’ve never considered eel before, but you’ve convinced me to at least try it once, someday. Ha,ha! You made me laugh. I might have to try the Pistachio delight! Thanks for making me hungry right before bed. That’s mean. I’ve eaten eel before (growing up in France, I ate a lot of gross stuff as a child) but I’d never eat raw fish/sushi, so good for you for trying it out! I believe my barbecued eel was cooked. Oh right, that’d make sense. I’m sure it would take good that way. I don’t have any bad memories about eel. Glad you have a sushi place there. My all-time favorite restaurant of all time was Alpine Village in Las Vegas (it was a German one). The atmosphere and food was to die for. Sadly, it closed a few years ago and no one bought it so that I could keep going. Why does that always happen to me with my favorite restaurants? I almost don’t want to like the sushi place by me…for I feel my curse will put them out of business. But I just can’t help it. That’s nice to know. I was getting a complex…hee,hee. eeeewww. i’ve tried sushi and didn’t like it one bit and i’m not as adventurous as you to think i’d like eel, but if it was in front of me, i would at least give it a nibble to make sure it was as gross as I thought it was. I’m mostly just wondering what movie your quote was from though.